Click Here to book a consultation with Virgil Isaacs to learn about what Corrective Exercise can do for you. In the “Best day/time for consultation” box, type “Corrective Exercise” along with your preferred times. We are getting geared up to launch a new service at Kalev Fitness Solution – Corrective Exercise. But what is Corrective Exercise? Here’s what Kalev Fitness Solution’s Trainer of The Month, Virgil Isaacs, has to say. Virgil recently became certified in the techniques of Corrective Exercise through the C.H.E.K Institute and is working together with all of the other great trainers and kinsesiologists at Kalev Fitness Solution to implement this new service for our clients. Keep your heads up for an official launch of the service involving brief explanations, interactive demonstrations, and prizes to be won. 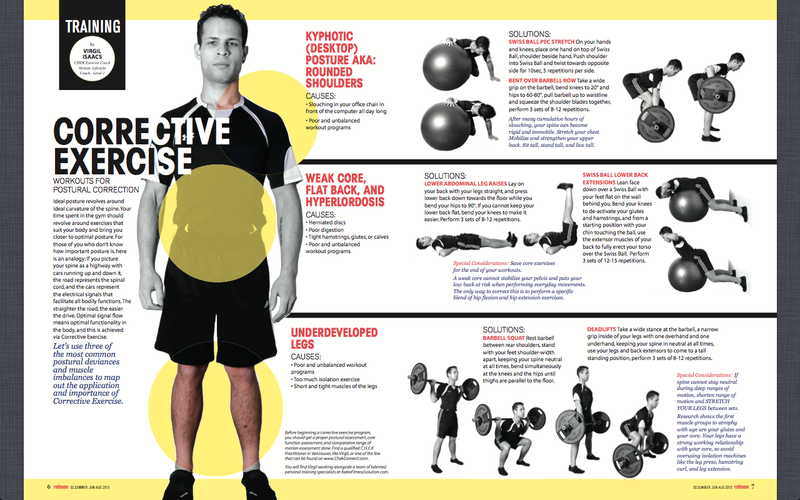 Ask the staff at the gym for more information, and in the mean time, take a peak at this local Vancouver magazine print on Corrective Exercise, featuring Virgil. Book your consultation with Virgil before July 31st and receive 50% off of your first session of KFS Corrective Exercise Services.